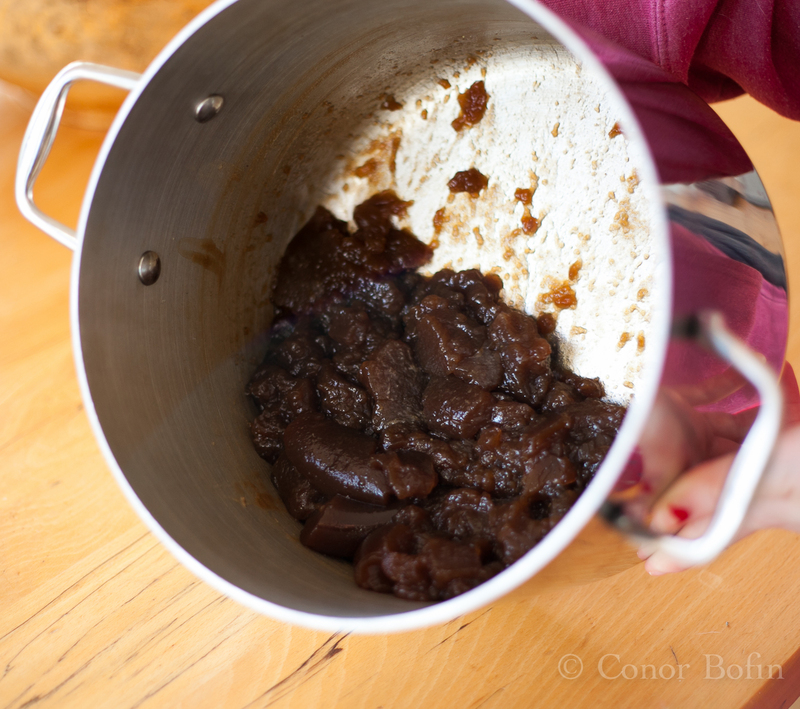 Seriously Reduced Beef Stock – Worth three days preparation? “Three days seems like a lot of trouble for a few cubes.” said the Wife. I was finding it difficult to disagree with her. 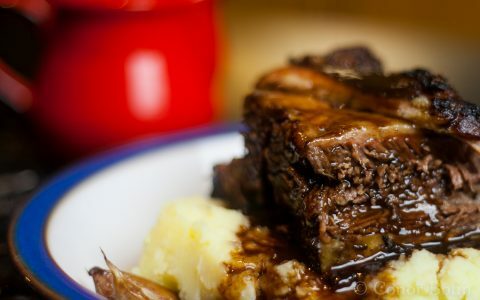 Enthusiasm had once again got the better of me and I set about preparing some seriously reduced beef stock to use as a base for stews, sauces and gravies. My butcher friend, Long John, (not to be confused with his colleague Big John) had very generously dropped off some beef bones. 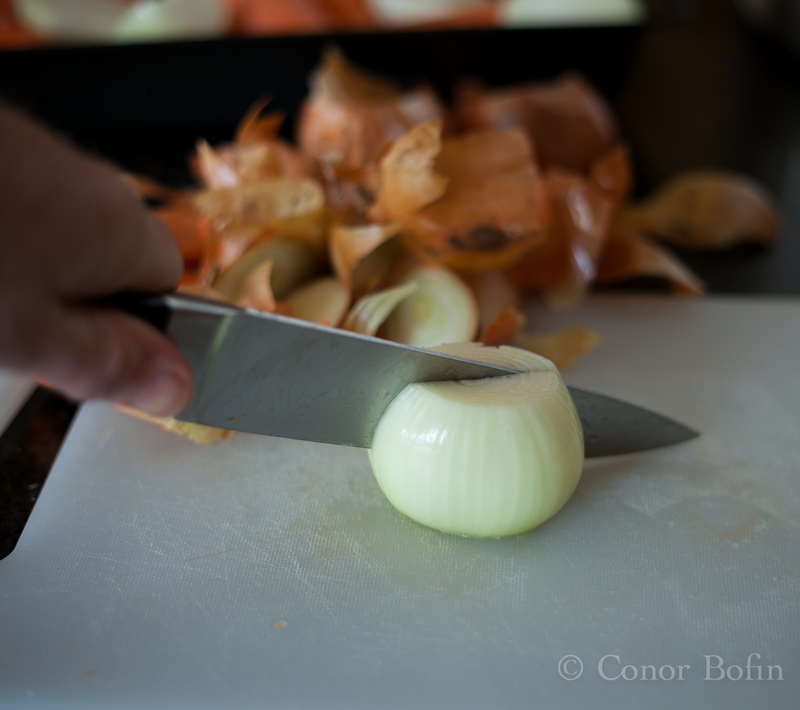 “This shouldn’t take too long.” I mused to myself as I took out my new stock pot. How wrong could I be? Ingredients: There is no need for a list. Look at the photo above. Day one: Take delivery of the beef bones and buy the vegetables. Put the bones in a roasting tray. 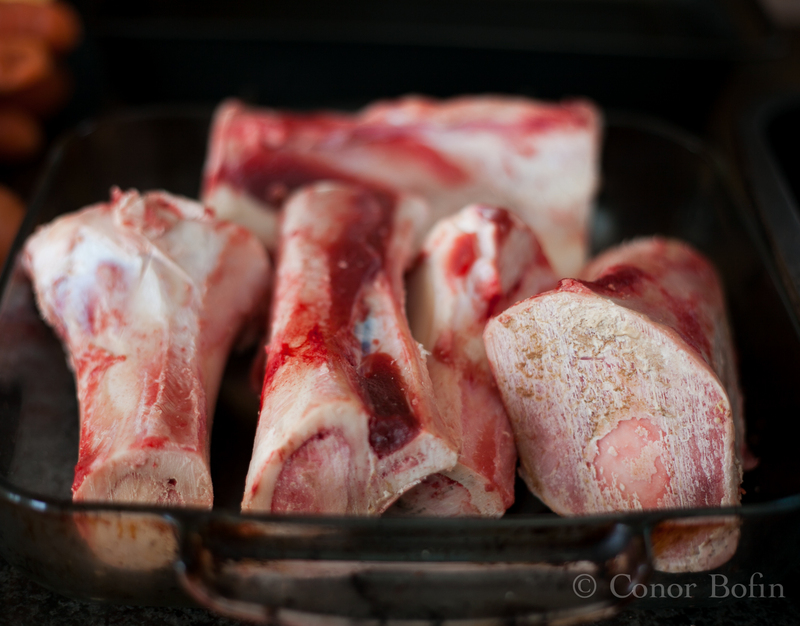 Some of the bones ready to go into the oven. Put the balance of the bones into a second roasting tray. I never thought I would be doing a gratuitous bone shot. Put the vegetables in another roasting tray with a little olive oil. The roughly chopped vegetables. ready to roast. Put all three trays in a 180º C oven for 45 minutes. This will brown the bones and soften the vegetables. 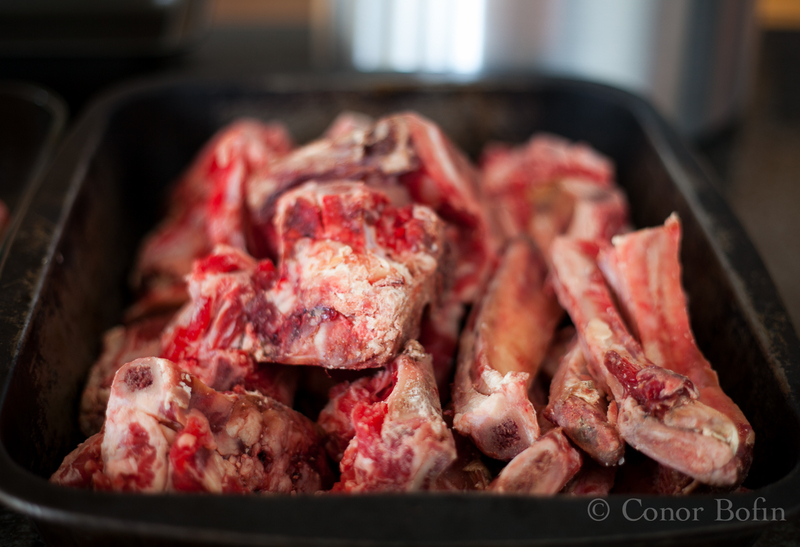 Bones, suitably browned and ready for the stock pot. Add the bones, the vegetables and the bay leaves to the stock pot. 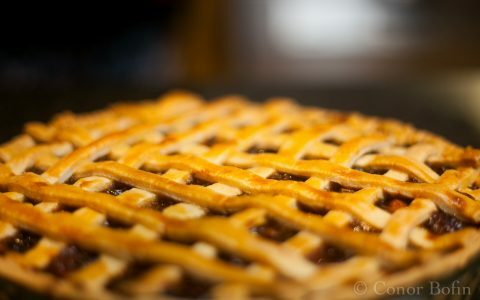 By the by, to get this shot, I had to put the tripod and myself on the kitchen table. Not a good way to score domestic points. 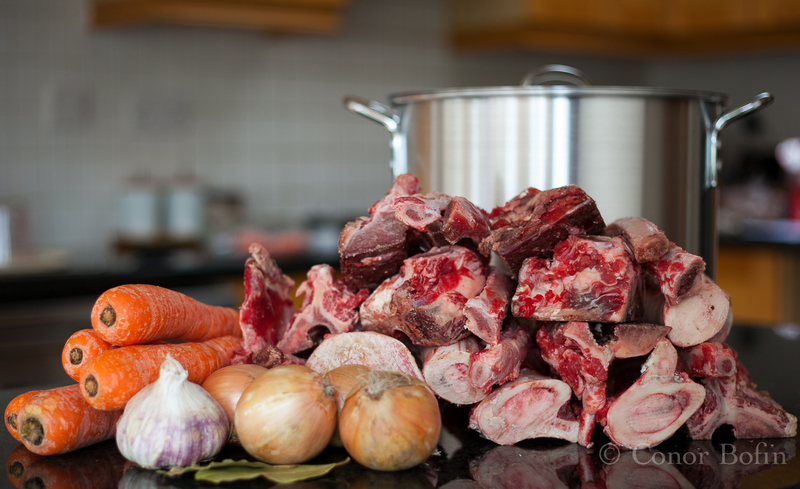 The essential ingredients for great stock – bones and vegetables. Next, add ten pints of water. Ten pints seems like an awful lot of water. That’s five litres or so. Bring the stock to the boil and simmer, covered, for three or four hours. Turn off the heat and spoon off as much of the fat from the surface as you can. By this stage, it will be time for bed. Day two: Lift the lid on the pot. Spoon off the remaining hardened fat. The bowl on the left contains pure beef dripping. This is great for making Yorkshire Puddings. Remove all the solid material – bones, vegetables, garlic and bay leaves. That’s lot of bones and stuff. All their flavour is in the stock. At this stage, there will be about a gallon of liquid left in the pot. Strain this through some muslin to remove any remaining fat and impurities. Do you like my cloth holders? I used car cleaning cloth as I had no muslin. Simmer the stock with the lid off. When you have reduced this by about 85%, turn off the heat. If you have done anything other than mind the pot for the day, it will be near enough to bed time again. Leave the pot overnight to cool. The reduced stock will be a jelly. Day 3: Whatever fat has not been removed can be soaked up on kitchen paper at this stage. Shake the jelly off the bottom of the pot and take a photo of it. Is that all I get? Don’t be disappointed. The intense beef flavour is worth it. Next, warm the pot slightly to liquefy the stock. 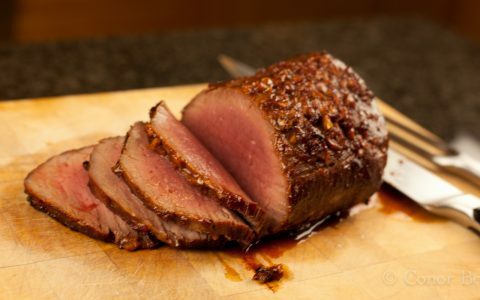 Pour it into ice-cube containers or an ice-cube bag for use in anything where you want an intense beef hit. A stock pouring shot. 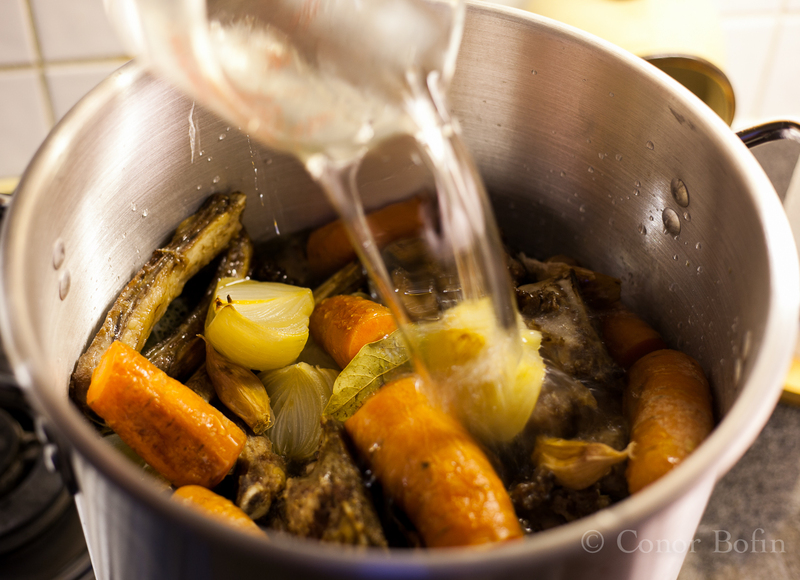 Or should that be a pouring stock shot? I got 56 ice-cube size ‘beef bombs’ and a little over, all ready for the freezer. I can’t wait to use them in soups, chilis, gravies, sauces and delicious other ways not yet thought about. 56 ‘beef bomb’ cubes. Not a lot from 10 pints and all those bones and veg. Or is it? I don’t think I will be putting any of them up here. Not yet anyway. Bahaha. Same to you my good man. So many potential puns, so little time. Your stock looks seriously wonderful. 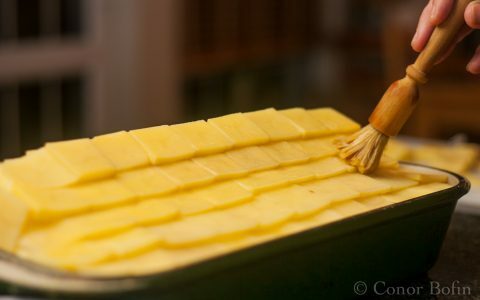 In your shoes, I’d be spreading a smear of the jellied stuff on hot buttered toast…. Just a thought. I do think it’s worth it, if you have the time. 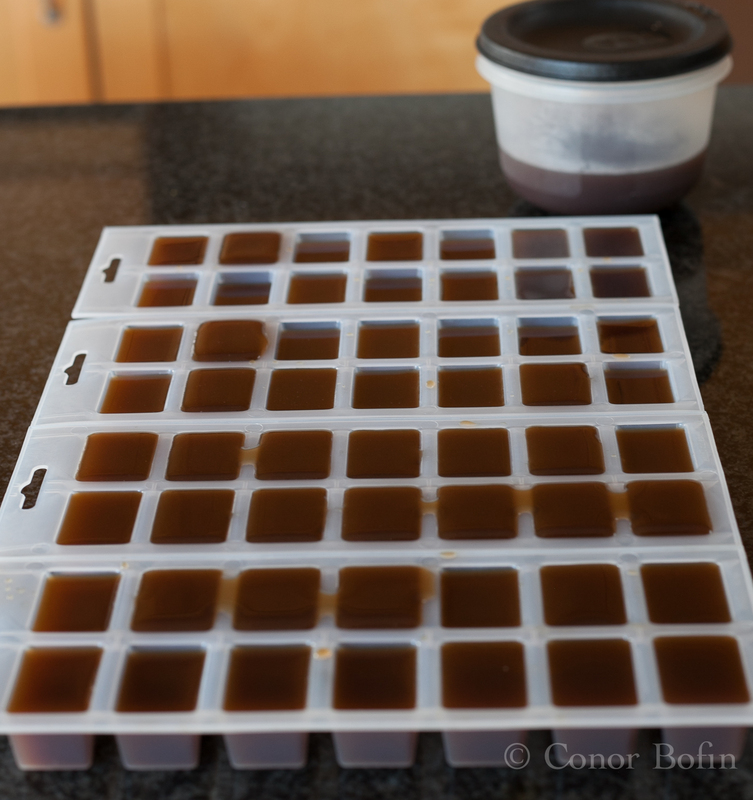 We just did some beef stock from a rib roast…I wish I had thought to super concentrate and put it in ice cube trays. Our current “stockpile” of veggie, chicken and beef stocks is in hulking quart containers and taking up entirely too much room in the freezer(s). 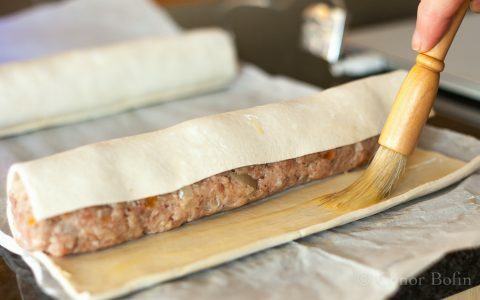 These are beautiful photos and I love how honestly it shows that good food can sometimes take a long time.Happy New Year! I too am suffering an overload of stock in the freezer (chicken). I might apply this principal to the next batch fo chicken stock and see how it rolls. Yup, I’m with Natalia on this one. My stock is also taking up valuable freezer space and concentrating it gives you such an amazing flavour hit. A lot of work today (or for three days) but a huge time saver down the line. 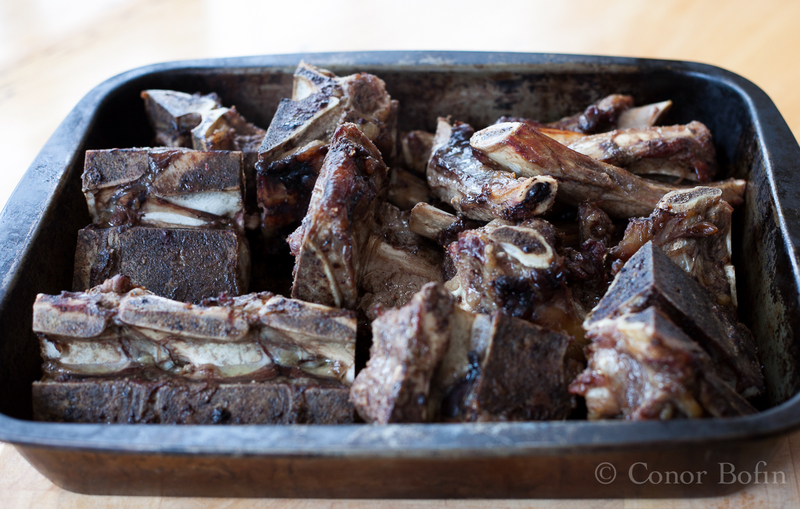 And how much better than those so-called “stock pots” you can buy pre-made, which taste of burned bones. Yes, I know the ones to which you refer. didn’t a once great chef sell out to promote their benefits? I used the first of them in an onion gravy. Wow, they add a beefy hit. I think it will be worth your time and effort when the stock contributes to some enhanced and flavorful meals in the future. Happy New Year. The tide of opinion is certainly flowing that way. Time will be our judge. Great idea MD. You might be the only person on the planet with reduced goose stock. You can take it one step further if you have a dehydrator. Spread it thinly on the rings you would use to make fruit leather and dehydrate it until it is brittle. Than you can put it in your spice grinder, coffee grinder, or mortar and pestle to grind it down to a very flavorful beef powder that is shelf stable.. I like it. That is certainly another step into the madness. If I suggested a dehydrator to the Wife, it might just send her over the edge! Very nice looking stock, Conor. 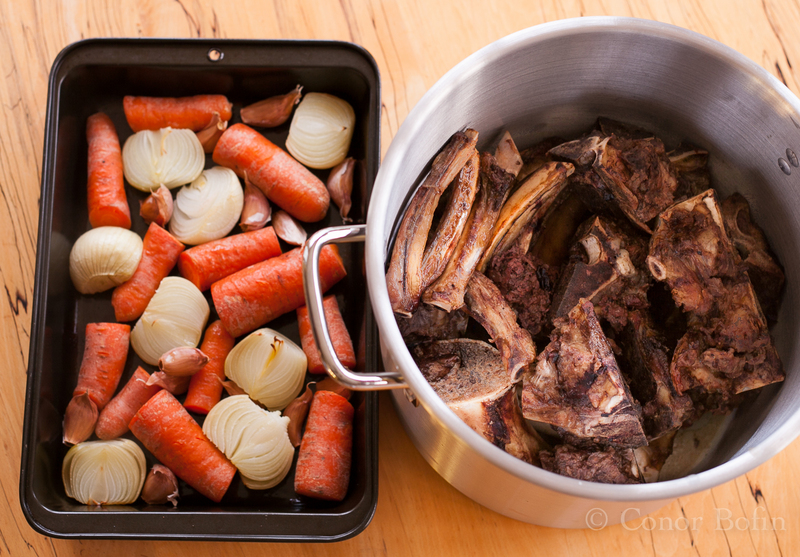 I am of the opinion that homemade stock is always worth the effort even when you take the extra time to reduce it down to a richer, more flavorful stock. 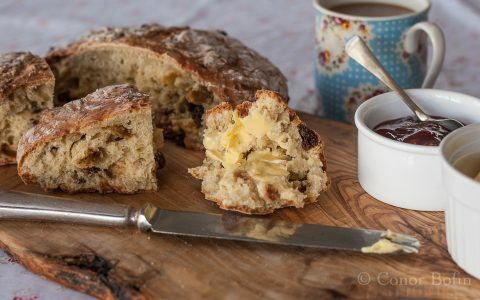 It is higher in nutrients, has no additives or preservatives and tastes much better. You simply cannot for wrong with homemade stock. Baby Lady loves the ice cube technique. 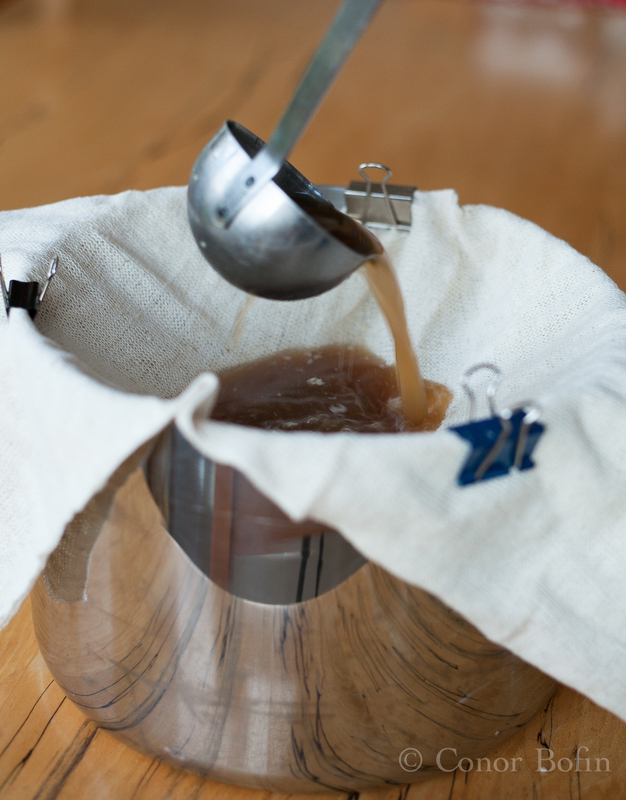 We typically cool the stock in Quart jars then pour them into sous vide bags and vacuum seal them. They lay flat in the freezer taking up less storage space. A good approach Richard. I have been doing homemade chicken stock for a while now. Once one goes there, there is no going back to the old ways. I plan to do a serious reduction on some chicken stock too. That will mean buying more cube trays or some bags. 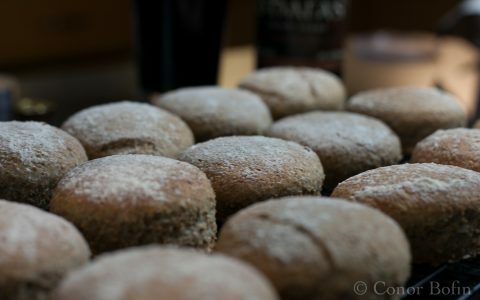 My first outing with the ‘beef bombs’ was with an onion gravy. It worked really well. Great flavour. They will also work superbly for a minute red wine sauce with a nice steak. The thought had not eluded me. Thankfully! Love the idea of the paper clips! Brilliant. Beautiful photos, as always! Thanks Mimi. I enjoyed the 3 day turnaround. For the most part, there was little to do except wait for things to either heat up or cool down. Oh yum! I think it was definately worth the effort! Great photos too! 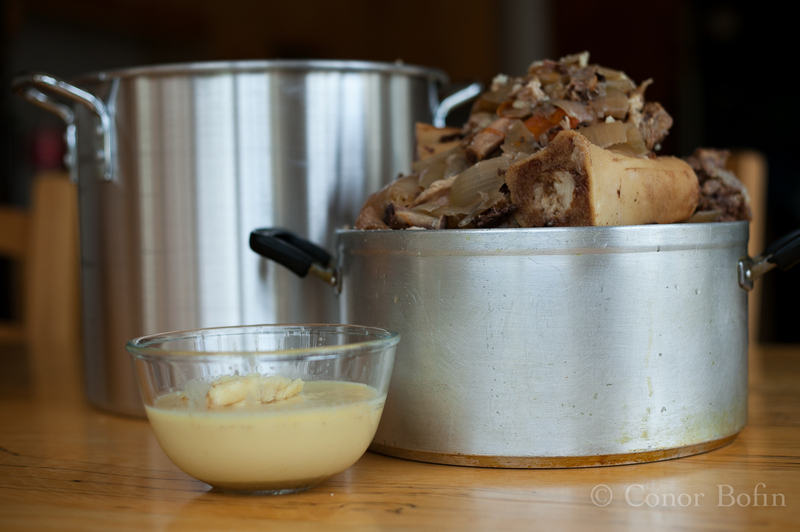 I make my own chicken stock (and duck and goose) fairly often, but I put mine in quart freezer bags. They lay flat, but I always lose them. On the one hand, finding surprise stock when you don’t have anything to make can be as good as finding a $20 in your coat. On the other, I don’t like losing food. I might just do this when I try to make venison stock from the deer bones I have- 4 whole femurs, a couple humeruses, and some lower leg bones. Great idea! I agree. Plenty of nice bones there. I have to admit that finding the missing cash is hard to beat. Yours looks great, what a lovely color! Glad you didn’t forget to keep the fat, which is great. I add some ground beef as well as the beef flavor is mostly in the meat and the marrow (the bones themselves provide the gelatin). I don’t think I’ve ever seen a risotto made with beef stock — that’s something to try. Looked to me like you browned them perfectly. For longer browning, you’d have to use a lower oven temp, but I’m not sure if the end result would get any better. We will only know when we try it, next time. Great idea. We have a pantry filled with jars of homemade stock. This would take up a lot less space. I love the idea of the intense flavour. Nice for powerful sauces. It’s good to use time well! whan an effort for bring a delicious soup, salute for you my friend! Fascinating, I’ve never actually made broth that way. Thanks for the education. Anything good is always worth the wait, right Conor? But seriously, this is great. 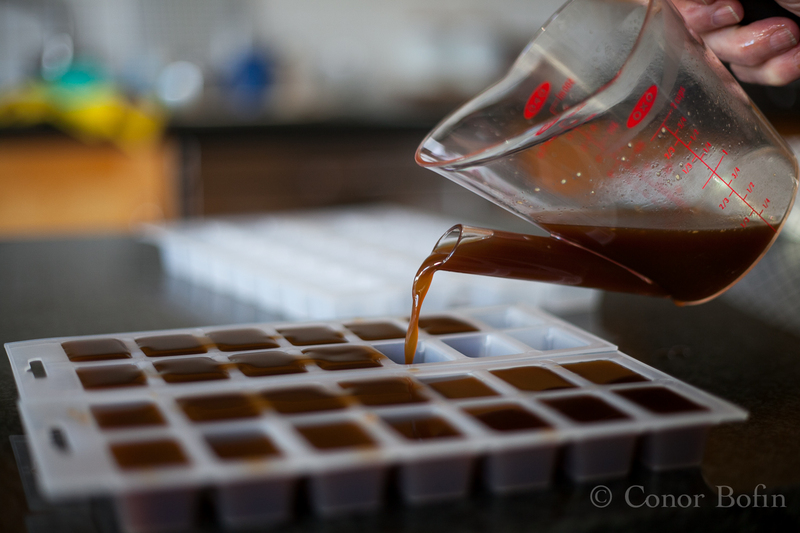 Love the repurposed ice cube trays. Very inspiring post! I make mine using a pressure cooker which saves some time… Great job. Something this precious deserves the time and effort you put into it! 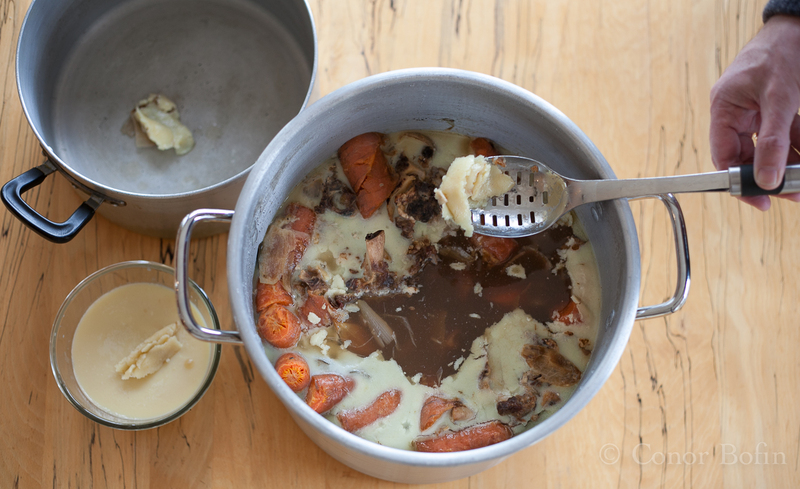 I think it was a fabulous move on your part…who makes beef stock like this? Only a well seasoned cook. I’m impressed and envious of all the wonderful ways you’ll be using these cubes. Thanks, the cook may be well seasoned. There is none in the stock. This leaves me free to add it to numerous dishes while not damaging my well seasoned arteries! Worth it every inch of the way! Three days sounds SO long, but one is only working on said stock a tiny fraction of the day. Have used the ice cube tray method awhile and find it the easiest. Must say yours looks great . . . hate to admit have some of the pots of ‘that’ chef’s offering in my pantry for emergencies . . . perhaps another New Year resolution 😉 ? And since the New Year is just over 10 hours away a very happy New Year to you and your family, Conor! Wow. Great step by step. What a brilliant plan. It’s like making your very own bullion cubes. I can see how that would be worth it! I’m with you. I’d do that just for one day of good stock, let alone a tray full. Happy New Year, Conor! This sounds wonderful, Conor. 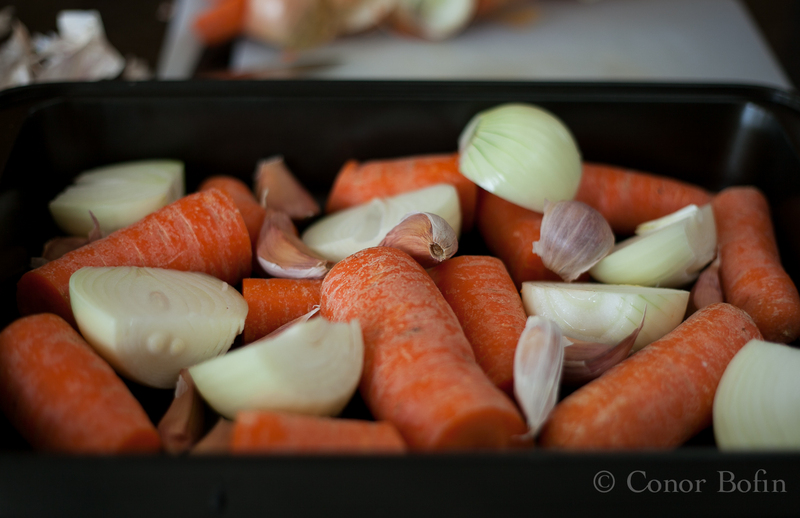 I’ll roast the ingredients and make stock, removing the fat as you do, but then I store it. Never have tried to reduce it further. I really should because you’re right. The result is some mighty taste “beef bombs” that are all real beef flavor and not chemically enhanced. This was a great post. Wishing you and your family a most wonderful New Year. Thank you John, 2013 was a bit on the tough side here. But, that’s for another day. We are looking forward to brighter and more enjoyable 2014. I wish you, Zia and your family every happiness. Homemade stock you cannot beat it. Happy New Year. Definitely a rhetorical question Conor! Great stuff – and can I echo the comment on the clips ‘tip’ – very useful. One in the eye for the M P White and his ‘stock pots’ 😉 Have a great New Year. Thanks Phil, Frank as ever! I want it! I have made some serious stock, but never that serious! I have been so tied-up,but I had to drop in and wish you all the best for 2014! With hopes that I manage my time better …for your blog,AND mine! Thanks for the kind thought. It can be hard to make time for the blog(s). Worth it in the long run though, just like the stock. By the looks of it Conor, I’d say it was worth it. No? Happy New Year and all the best to you and your loved ones in 2014! Now that the work is in the past (last year), of course it was worth it. The big pile of bones and all that steaming is kind of a man thing. I’m sure you could convince him to get stuck in. Finally got to make this stock. Had to wait until Himself had gone fishing for a few days as he doesn’t like the way the house smells when I make stock!! I found out my local butcher, who have their own abbatoir give the bones away for free. I didn’t have as many as in your picture and I only added 3L of water so I boiled them for about 2.5 hours. (It was late and I wanted to go to bed!) When I reduced them down the next day the end product wasn’t as gelatinous. 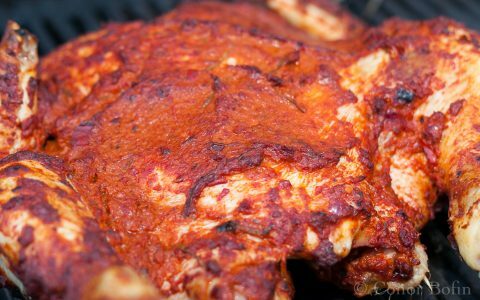 Do I need more water and boiling to get more out of the bones? Either way it still tastes great and the freezer is full of ice cube trays. Will transfer them to ziploc tomorrow. A great start Emma. My butcher friend gives me mine free too. It’s a real bonus. 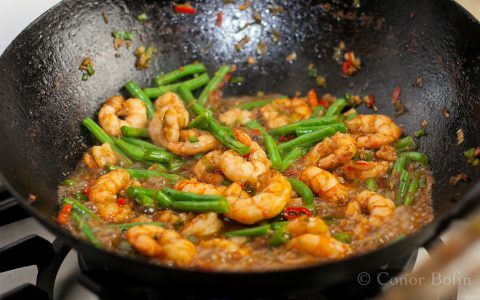 Longer simmering would be the answer, combined with ruthless reducing. What you have will be fantastic. Do be aware that nearly every store bought stock is laden with salt. You will possibly need rouse more than you might think. Thanks so much for letting me know. It gives me a buzz to see. 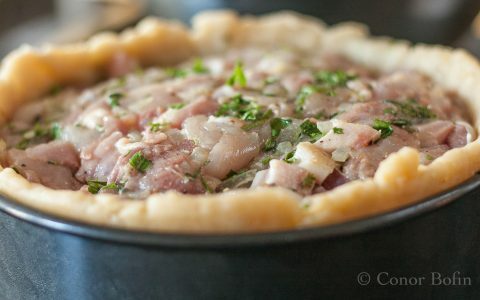 I just made some using the same proportions as the picture, times 1.5, and added celery tips and bottoms and 2 tablespoons black peppercorns. Not what I expected. So much carrot. Mine tastes like like a beef flavored jelly. Next time I’ll be trying with about a fifth of that carrot. I used a fan to reduce the vapor pressure on the pot, and on a pretty low heat reduced for about 16hrs in two parts. Still not the gelatin from your pic, but thick enough. Might be more gelatinous next time with out all the sugar. What about the flavour Buddy? If you get the intense beefeyness, the rest doesn’t matter. Thanks for sharing. I’ll reduce the carrots next time out too and see how we go.